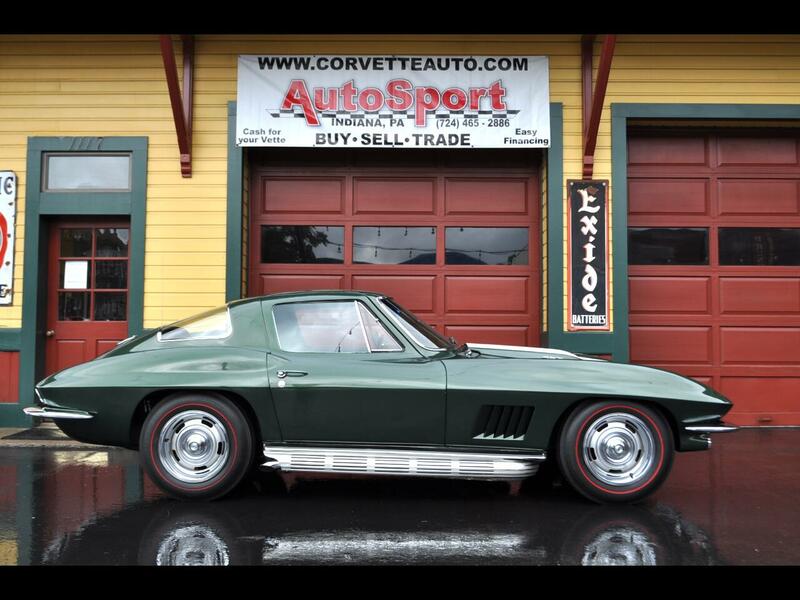 Used 1967 Chevrolet Corvette Goodwood Green Tan 427ci 390hp 4sp Big Block! for Sale in Indiana PA 15701 AutoSport Co. Trim: Goodwood Green Tan 427ci 390hp 4sp Big Block! For sale is a 1967 Goodwood Green White Stinger, Tan Interior Big Block 427ci 390hp Corvette Coupe w/ Side Pipes! This car has the correct #’s Matching 427ci 390hp engine! Finished in its factory color combination, Goodwood Green paint with a white Stinger hood. The paint is in good condition and shows well. The body is in good condition with a good fit and finish all the way around. The doors and hood line well and fit perfectly. This Corvette has been outfitted with correct side exhaust that gives this big block Corvette the character and sound we all love about these cars. The red line tires are a good color combo with the Goodwood Green paint, White Stinger, and Tan interior. The Chrome bumpers and stainless trim are all in good condition as are the side pipe covers. The interior is in excellent condition and is factory correct. All the factory gauges work as does the radio. The seats, door panels, dash, and dash pads are in excellent condition. The stock jack is in the rear compartment. Under the hood it is detailed and factory correct with all the correct shielding and valve covers. The 427ci 390hp is a correct numbers matching engine and there is a good picture of the front engine pad. The frame is a solid clean rust free frame in excellent condition. This Corvette has a solid clean bird cage as well. Above everything this car looks great and runs even better! The engine runs smooth and has that great 427 big block sound blasting out of those side pipe! Please feel free to call us at 814-977-9219 or email us with any questions.